Stevenson is accused of killing Rice, 53, while he lay in bed. Police discovered Rice’s body about 9 p.m. after his wife reported that he was blocking her entrance to their bedroom and was cold to the touch. Police said Rice was shot in the chest with a .357-caliber handgun, whose owner remains unknown. A wheelchair-bound Stevenson appeared before a judge via video Monday morning and said little. She is being held in the St. Johns County jail without bail. 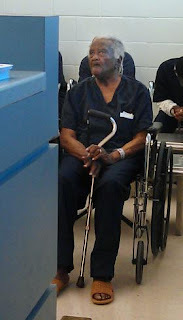 Yesterday, on another site, I was accused of equating the elderly and the severely handicapped with criminals. This nonsensical accusation came from a post I wrote once in which I made, what I thought was a common-sense suggestion, that some elderly people and some handicapped people cannot responsibly handle firearms and should be disarmed. The key word in category 5 is "incapacitated." 1. anyone who has ever violated a gun-law but has never been convicted of a felony. 2. anyone who abuses his wife or children in any way but has never been convicted of it. 3. anyone who is addicted to drugs and/or alcohol but has not yet been disqualified. 4. anyone who has ever dropped a gun or caused a negligent discharge. 5. anyone who has become elderly or otherwise physically incapacitated. Do you think Ms. Stevenson might have benefited from disarmament? How about her nephew and his family? Why do gun-rights folks resist these simple and obvious suggestions so? Do you think they're afraid they themselves may be swept up in a frenzy of disarming people? Is it the slippery slope spectre that has them spooked? What's your opinion? Isn't it possible to raise the bar in order to improve the quality of those who own and use guns without trampling people's rights? I think so. Seems sensible to me. Whatever the condition (age, medicine, physical inability), if a person isn't able to think clearly enough to make a life-or-death decision or isn't able to aim a gun properly, they shouldn't be allowed to possess a firearm.